In 1978, Chinese archeologists excavated the Tomb of Marquis Yi and Zeng in Suizhou City, Hubei Province, thus revealing one of the most important discoveries in Chinese archaeology history. 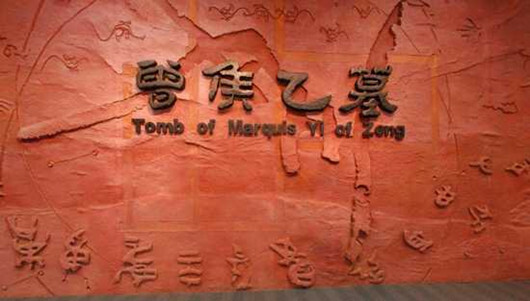 It is the Tomb of Marquis Yi and Zeng in early Warring States Period, who was buried in about 433 B.C. The tomb, built out of red conglomerates, is 16.5 meters long and 21 meters wide. An outer coffin is placed in the tomb, which contains four rooms respectively in the east, the center, the north and the west. The double-layer coffin is placed in the eastern room, with the outer coffin built with a bronze frame, while door, windows and guardian divine animals and warriors were painted on the surface of the inner coffin. The central room accommodates the funerary objects of ritual and musical instruments. Weapons and carriages are found in the northern room, while 13 coffins for human sacrifices are placed in the western room. Over ten thousand funerary objects are unearthed from the tomb. The bronze wares boast a large volume totaling 6239 pieces, among which there are 117 ritual objects and 17 utensils in altogether 38 varieties. 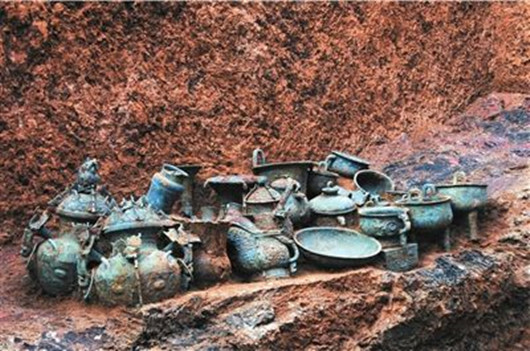 The Bronze Chime-bells of King Yi of the Zeng State embodies 65 pieces of instruments, boasting the largest and best-preserved bronze chime bells discovered so far. A large amount of other bronze musical instruments have also been excavated, including chime stones, drum, Se (the horizontal lute), Sheng (the reed Pipe) and Pai Xiao (the circular bamboo Pipe), which are in orderly sets or suites presumably arranged according to the conviviality held for the host before his death. Inscriptions such as "Zeng hou yi" ("King Yi of the Zeng State") are carved on many of the bronze wares, providing us evidences for judging the host of the grave. Gold calices, gold cups, gold belt hooks, and a 16-segment jade pendant of dragon-phoenix design as long as 48 cm are also found in the tomb, vividly presenting the details of the luxurious life of King Yi. 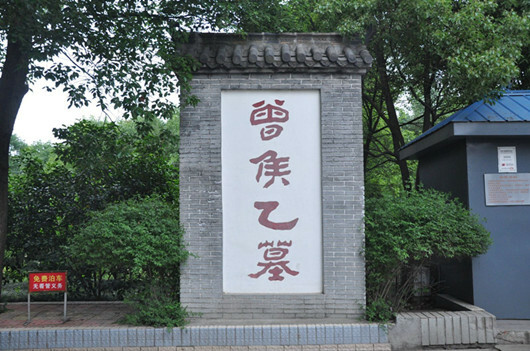 The excavation of King Yi’s tomb has provided precious updated data for archeology of the Spring and Autumn and the Warring States Periods of China, which is especially significant for studying the ancient musical instrument history and technical manufacturing history in China.